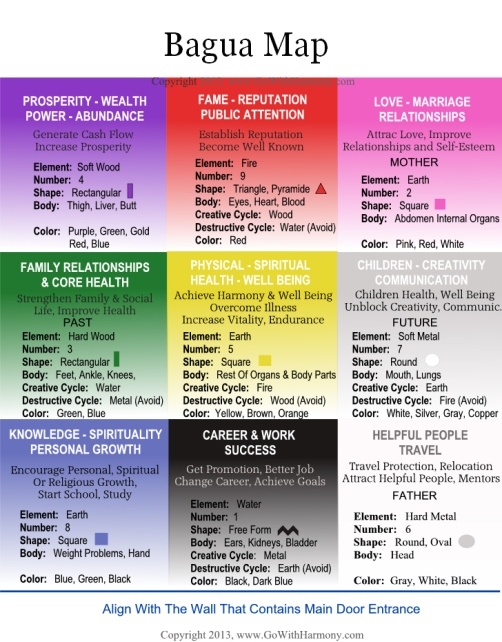 Home Bagua Map To Print and Use To Change Your Life. Home Bagua Map is very helpful tool to use in order to change the energy in every room of your house, office or business. Review all types of Bagua Maps below. Use links to download larger size of each Feng Shui Bagua Map. 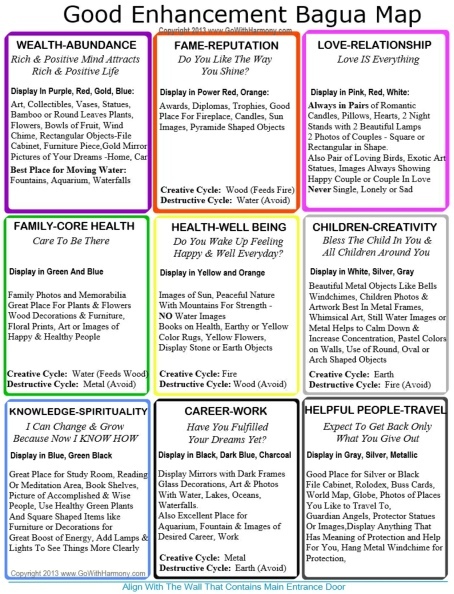 Print and use them to make positive Feng Shui changes in your home or office. Click Here To Download Detailed Enhancement Bagua Map Below. It's a great tool to help you pick colors, shapes and materials to do your Feng Shui cures. 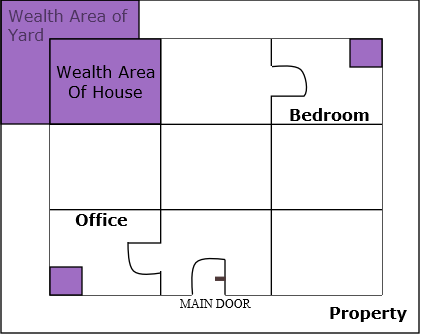 Click Here To Download Detailed Home Bagua Map Below. Use it daily to apply cures and enhancements to all nine Life Areas/Guas. 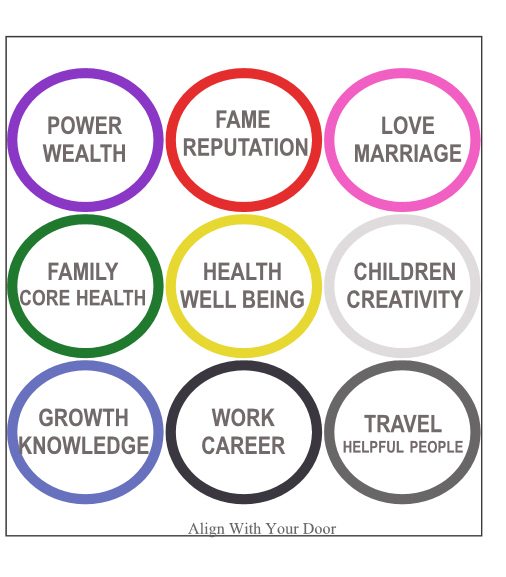 Locate any of the 9 Life Areas by learning how to properly applying Feng Shui Bagua to your home or particular room. How To Get What You Want FASTER with Home Ba-gua. If you want to achieve success in certain area of your life, apply Bagua in multiple rooms to maximize the results and achieve changes faster. Click here for detailed instruction on how to find each Feng Shui Wealth Spot to increase prosperity and cash flow. Don't worry, these enhancement can be as easy as adding a purple color, fountain or waterfall painting to your Money Areas. Feng Shui Bagua map can truly change your life by helping you minimize negative elements and improve areas that need energy and your attention. Once you balance Life Areas according to Bagua, your subconcious mind will feed off positive messages on a daily bases. You will not only transform your home but your mind and entire life as well. Stay positive, thankful and focused when using Bagua to energize your home. Start fresh and leave all negative thoughts behind.